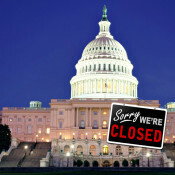 Our Government is “shutdown”… but what about the NICS and your right to purchase a firearm? I read a funny tweet today, day one of the government shutdown. Due to the #shutdown, the US government isn't working today. Of course, it wasn't working yesterday either. While that seems oddly accurate there are things that regular people may require of the government. For instance, the NICS background check system. Will this be operational while the government is “shutdown”? I put shutdown in quotes because of all the people who get furloughed, guess who STILL gets paid…yep…CONGRESS and the President. But I digress, will American citizens be allowed to purchase firearms that require a NICS check or has the government once again finagled their way into infringing the rights of law abiding citizens? The Federal Bureau of Investigation runs the NICS system out of the FBI’s Criminal Justice Information Services Division in Clarksburg, West Virginia. Oh yeah, the FBI is still funded during the “shutdown”. And as the FBI notes on their own website, “NICS is available 17 hours a day, seven days a week, including holidays excluding Christmas”. So while the government is “shutdown” and Congress and the President still get paid, there should be no interruption or infringement to the 2nd Amendment other than the need to get a NICS check in the first place. So much for being innocent until proven guilty. Now, if the FBI refuses to do NICS requests and tries to blame it on the shutdown then there is something rotten going on.